Right-to-Work Is Right for Us! All workers should be free to choose whether union representation is worth part of their paycheck. Yet in New Mexico, too many are forced to pay union dues as a condition of employment. 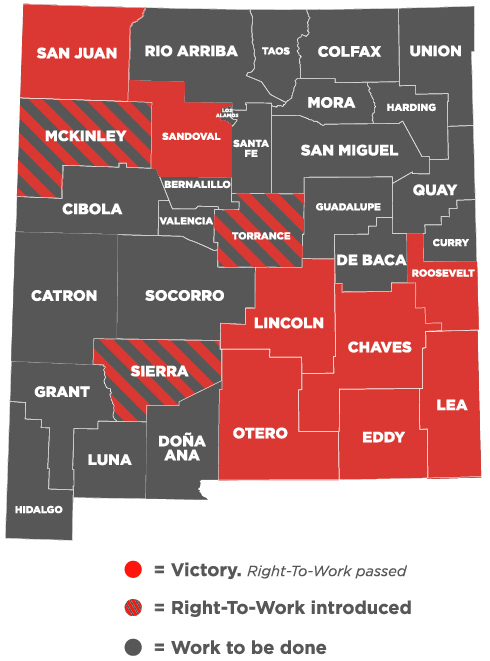 Numerous counties in New Mexico — such as Sandoval, Otero, Eddy, Lincoln, San Juan — have passed right-to-work ordinances. But every single county should stand up for its workers and join this positive trend. Americans for Prosperity-New Mexico (AFP-NM) applauded the McKinley County Commission for voting 3-0 to post for public consideration a right-to-work ordinance, setting the stage for a final vote on the measure later this month. Americans for Prosperity-New Mexico (AFP-NM) on Tuesday applauded San Juan County commissioners for passing the right-to-work ordinance introduced by commissioners Margaret McDaniel and Jim Crowley, making San Juan the eighth county in New Mexico to expand workers’ rights. Americans for Prosperity-New Mexico (AFP-NM) on Thursday applauded Lea County commissioners for unanimously passing the right-to-work ordinance introduced by Commissioner Rebecca Long, making Lea the seventh county in New Mexico to expand workers’ rights. Americans for Prosperity-New Mexico (AFP-NM), the state’s leading grassroots advocate for economic freedom, on Tuesday applauded Roosevelt County commissioners for passing the right-to-work ordinance introduced by Commissioner Matt Hunton, making Roosevelt the sixth county in New Mexico to expand workers’ rights. Americans for Prosperity-New Mexico (AFP-NM) on Tuesday applauded Eddy county commissioners for unanimously passing the right-to-work ordinance introduced by Commissioner Jon Henry, making Eddy the fifth county in New Mexico to expand workers’ rights. Americans for Prosperity-New Mexico (AFP-NM) applauded the San Juan County Commission for voting 4-0 to post for public consideration a right-to-work ordinance, setting the stage for an August 7th final vote on the measure.